“The ideas of Bhagat Singh, even if not wholly but substantially have been incorporated as pre-ambular vision of our Constitution. But the dream for which he sacrificed his life has not been fulfilled and the relevance of what he said can hardly be ignored. 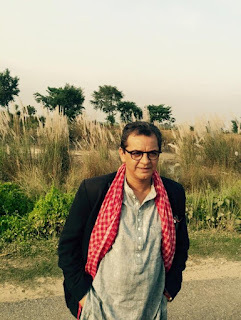 The ground realities, if at all, changed only marginally”, says Supreme Court of India. The move by present Government of India to omit out words Socialist/Secular from our Constitution raises suspicion to overrule the idea of Independent India what Shahid Bhagat Singh thought of. Russian revolution inspired Bhagat Singh to the core, so he had great regards for Lenin. The turning point came in 1928, September 8-9, Delhi, Ferozshah Kotla, Hindustan Republican Association (HRA) got transformed into Hindustan Socialist Republican Association (HSRA). Word Socialist was added to its name & Socialism became their ultimate goal to be achieved. 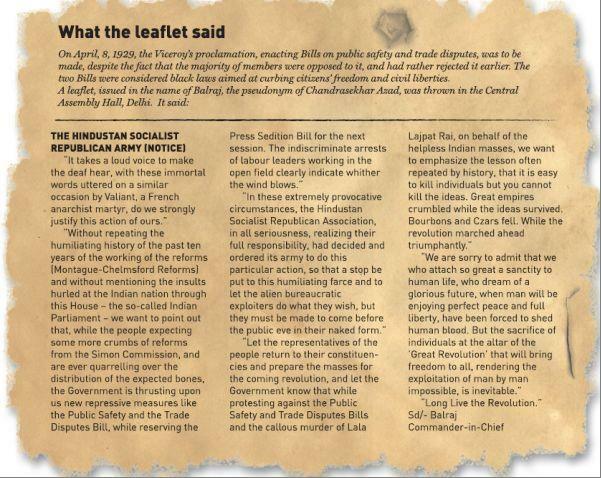 Here is an image of the leaflet which was thrown by Bhagat Singh & Buttakeshwar Dutt along with harmless bombs in assembly hall on 8th April, 1929.